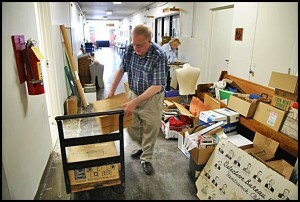 Greg Kowalski, Chairman of the Hamtramck Historical Commission, and volunteers begin moving the commission’s collection of artifacts from city hall to the new historical museum. If you’ve ever imagined a gathering place that celebrates the rich diverse history of Hamtramck — a meeting place that would also evolve to include the present day cultural fabric of the town — then wish no longer. The new Hamtramck Historical Museum aims to do all that, and more. Not only will the museum provide a home base for the vast collection of local resources that has been collected by the Hamtramck Historical Commission, the museum will also provide links to the past and a bridge to the future by offering ongoing workshops, a speaker series, book signings, tours, educational archives and relevant, revolving exhibitions. The Commission is moving full-speed ahead with the goal of opening during the annual Hamtramck Labor Day Festival. Since forming in 1998, the seven-person Historical Commission has always maintained that establishing a historical museum was the top priority. In 2004, when the state awarded 19 communities in Michigan up to $100,000 in catalyst grant money and a toolbox of other funding resources, Hamtramck was one of the lucky recipients of the award. The signature project chosen by Hamtramck was an adaptive reuse of a building that would showcase the vitality of Hamtramck’s history and heritage, and preserve this history for future generations. The journey to finding a permanent home for the vast collection of Hamtramck-related historical treasures has been a long one. After being awarded Cool Cities grant money from the state, the Commission purchased the former PLAV Post 1 building on Holbrook. However, the repairs needed to make the building functional and code-compliant were too costly. The Commission made the tough choice to put the building back on the market for sale. The move into the historical museum will take some time because of the vast amount of items collected for the past several years. 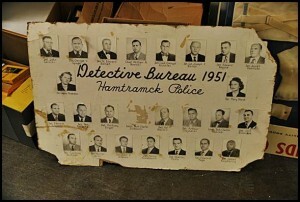 Above: Photographs of the officers in the 1951 Hamtramck Detective Bureau. In the meantime, a local businessman donated a building on Jos. Campau to the Historical Commission. The building is conveniently located in the heart of downtown, adjacent to the Polish Art Center. Ironically, the building has a bit of history itself. It was the former home of Wister & Schwartz, Hamtramck’s first department store. Any profits made from the sale of the Holbrook building will be used to upgrade this new location. The Polish roots of Hamtramck are strong, and as such, represent a large portion of the museum’s collection. However, the Historical Commission stresses that the museum embraces — indeed belongs to — each ethnic community within Hamtramck. With that goal in mind, the Historical Commission is opening their arms to the entire community, providing a welcome mat for all immigrant groups within Hamtramck. A main focus of the museum will also be as a tour anchor for the growing heritage tourism industry. As part of Gov. Snyder’s economic program designed to highlight Michigan’s wealth of natural and cultural resources, Hamtramck fits right in to these placemaking stimulus policies. The Historical Commission plans on capitalizing on this effort by linking activities and tours with other local historical preservation groups. To find out more about the Hamtramck Historical Museum, visit their website at www.hamtramckhistory.org. To help move the vast collection of items, to volunteer at the museum, or to donate items, please check for updates on the Hamtramck Historical Commission Facebook page. To learn more about revitalizing our communities by creating a “sense of place,” check out the resources at www.miplace.org. Very exciting. Keep up the good (hard) work ! My Dad is 89 – born/raised in Hamtramck (Poland St. and also Norwalk) – spent teen years in 32nd street neighborhood. 1st language Polish. He’s still alive, clear thinking but can’t walk. You may want to call him if you have any questions – his family were friends with then chief of police (dad knows his name, I don’t) – anyway, dad’s not going to be living much longer, please call him. He’s fun to talk to and clear thinking in mornings mostly. He’s an early riser usually but 9 or 10 am would probably be best. His # is 7347213488. I’m his daughter (906-353-7795) and am very close to him and relatives – many of whom are old and grew up on Norwalk Street. I brought him to visit the store a few years ago when He was first getting to where he couldn’t walk. He would just love to chat with you. He is cousins to a fairly well known (deceased) author Harry James Cargas – also raised in Hamtramck. Many stories there. I could give you phone numbers of others who have stories to tell. They mostly speak Polish as 1st language, English as 2nd. I have done much genealogy work on this family also – my ancestors. I am Cheryl and Dad is Glen. We came to the Polish Arts center a few years ago so you could meet him. He lives in Westland now in his own home. Anyway, please contact him – we have many old photos too that may be of interest to your museum so as I am going through his things, maybe I can share some of this stuff with you. We also have photos of relatives from the old country. Sincerely, Cheryl T.